I've been working on a lot of different things this past week. Here's a quick summary of it all. The weather has finally turned beautiful, warm and spring-like, so the snow is all gone from our yard! 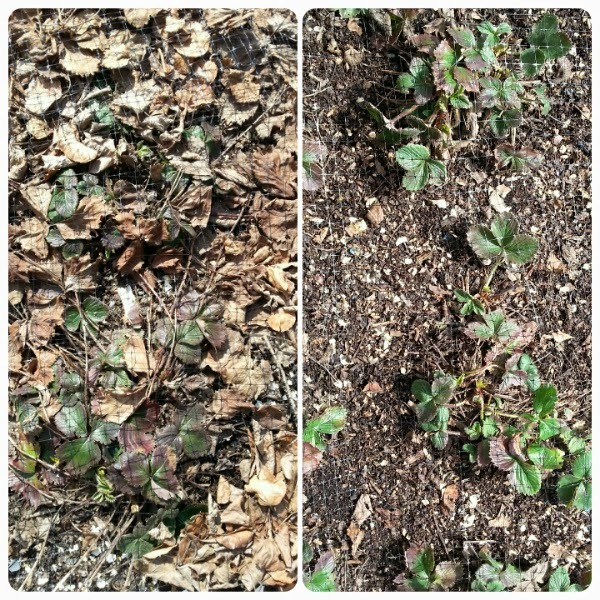 That means I've been able to get the old leaves and debris out of my strawberry bed. This picture shows before and after the cleanup. It's nice to see that all of my plants are growing. I can't wait to have an abundance of fresh-from-my-own-garden strawberries! One day last week I sewed four sleeves for quilts that have been waiting in the cupboard while I put off adding a sleeve so I could actually hang them. I spent time over the weekend hand stitching the sleeves, and so far I have two finished and I'm about halfway through the third. It will be good to get them all finished so I can finally create my mini quilt display. Also last week, I received Chelsea's Round Trip Quilt. Chelsea blogs at Patch the Giraffe and she requested solid colours with low volume backgrounds for her quilt. 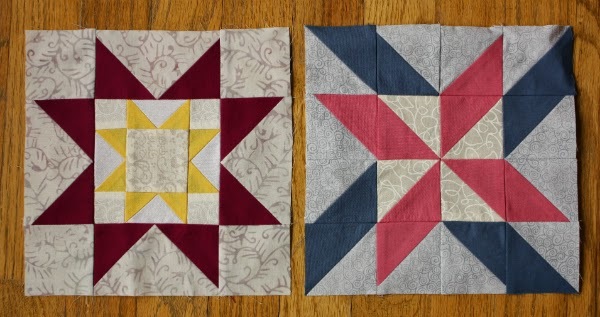 So far I have made these two blocks. 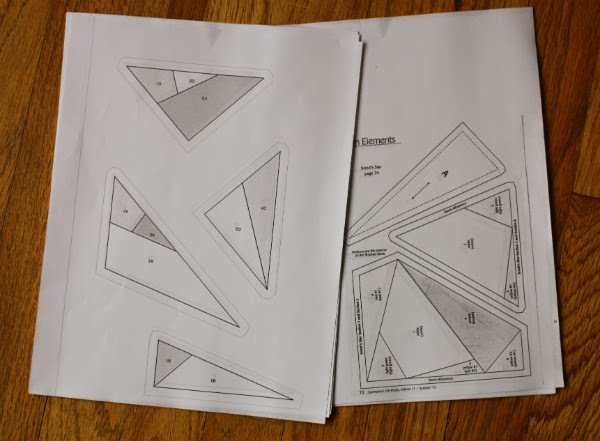 I have the paper piecing foundations printed for the other two blocks I plan to make, so now I have to decide which colours to use and then I'm good to go. 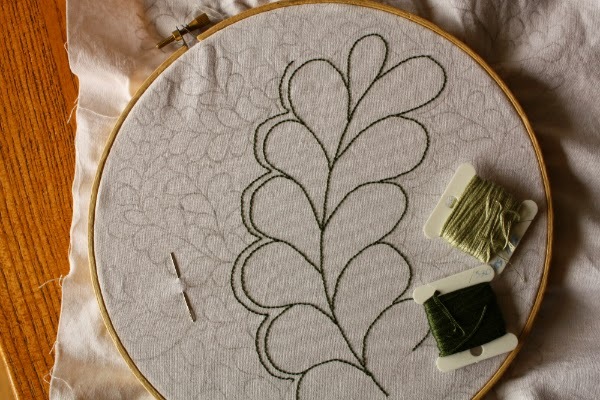 I'm using the dark green to embroider the main feather and I'll use the light green for the background feathers. There are a lot of background feathers, so I have a feeling this one is going to take a loooong time to finish. So, no big amounts of progress on any one thing, but lots of little bits of progress for this week. 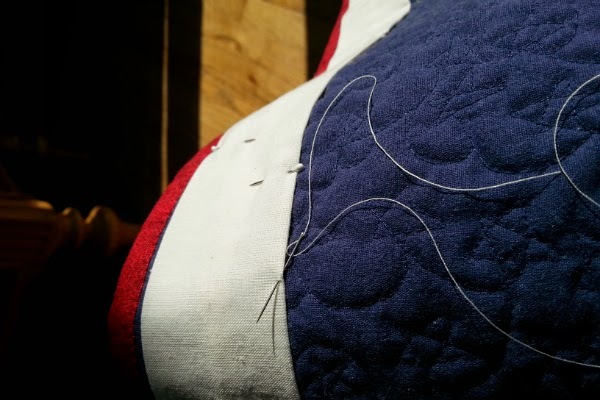 I hope you're making progress on your projects too, whatever they may be! Halfway there on the round trip quilt already? Well done! I look forward to seeing your mini quilt collection hung and on display! I love the looks of your feather embroidery. Handwork is so calming. Your feather embroidery looks lovely, will enjoy watching your progress.